You might notice a distinct lack of a designer or writer in the group dynamic. Many of my groups often wondered about that, as well, but the program demanded those duties be a collaborative effort. It was pretty common for me to write some dialogue or build some models, and the sound person in my group to create a little code. The forced interdependence proved to be a valuable learning experience, because the more we understood the different roles firsthand, the better we were able to perform as an actual team. One of the most valuable lessons we learned early was how to work fast. Since our time was so limited, we had to focus on our world's core experience. There was very little time for pre-production, and we had to jump in and get working on a tangible product immediately. "Getting something built and running allows for multiple iterations, which is the key to a strong experience," says Schell. At the halfway point of each project, students receive feedback from the rest of the class on their world's state, which gives the teams a chance to regroup and fix anything they may have missed. At the end of the two-week period the groups present their work. 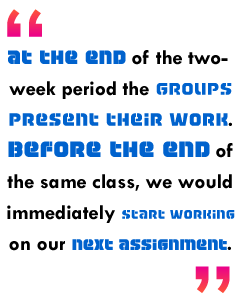 Before the end of the same class, we would immediately start working on our next assignment. We were encouraged to take risks because if we failed we would only lose two weeks. As is so often true, the groups learned more from those failures than they did from their success. Throughout the class, students write feedback for their fellow classmates, which gets handed out at the end of the semester. It can be very painful to read what your former teammates have to say about you, but everyone agrees it's the most important part of BVW; it's a reality check that everyone in the class can use to help make himself a better teammate in an industry based on cross-disciplinary teamwork. The semester culminates in the BVW Show, where kids can be monsters and students can build their dreams. Schell describes it as "a mix of performance art, videogames, computer animation and audience participation - a virtual reality vaudeville show that has become a Carnegie Mellon tradition." We learned countless lessons in the BVW class. We were pushed in every direction and forced to adapt. The course taught many things artistic and technical, but I learned the most when I got feedback from my teammates. It's a rare thing, in this or any industry, to receive honest feedback not only on your work, but on yourself. BVW is about doing, creating, making and achieving while learning. There's no better way to grow professionally. Seth Sivak is a freelance contributor to The Escapist.